In order to post a listing on the PTOS Bulletin Board, you first need to register a Bulletin Board (BB) account. Registering an account allows you to post ads, return to update/edit your posted ads, to renew your ads when they near their expiration date, and to delete your ads. You register a BB account by first clicking on the "Register" link on the main BB page. This will take you to the registration page. On the registration page you will be asked for a username, email address, and password. 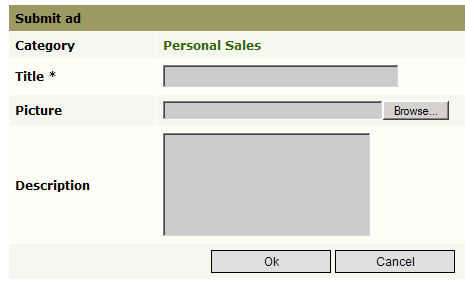 The username and password allow you to log into the BB and post listings or edit/renew your old listings. The username can be any username that you desire, provided someone else has not already registered that same username. The email address should be a valid email address because the BB system will use this email address to contact you when your listings are about to expire, and to allow you to reset your password should you forget your password. Once you register you will automatically be logged into the system. If you already have a username/password pair, you instead should click the "Login" link on the main BB page, enter your username and password, and click "OK". Change Password - This link will allow you to change your password. Logout - Use this link to log out of the BB when you are finished. My profile - This link will allow you to edit your email address, should it need to be edited. My posts - This link will give you a listing of all your BB postings so you can edit/update them. Recent posts - This link will show you the most recent new postings across all categories. Home - This link will return to you the BB home page from whereever in the BB you happen to be at the time. To post a new listing, you must first choose an appropriate category and click on the category section. For example, lets say you wanted to sell your old laptop computer. You would click on the "Personal Sales" category. This will take you to the personal sales listings of the BB. Along the top of the screen just above the items listed on the BB will be another set of links. There will be one new link present, it is named "Submit Ad". This is the link that you must click on to submit a new ad into the Personal Sales category (or whichever category is appropriate for the ad you want to post). On this page you will be asked for three pieces of information. First, you must give your ad a title, so you should choose a title and type it into the box marked "Title". Next, if you have a picture on your computer that you would like to attach to your ad, you should click on the "Browse" button and locate the picture on your local computer. The "Browse" button will open a file chooser window which will work much like "Save As" or "Open" from MS Word ®. You will be viewing your local computer's disk, so you have to locate the picture on your own computer yourself. Finally, you should enter a textual description of the item you have for sale in the "Description" box. You should include all necessary information about the item, and if you want someone to contact you in a particular manner, say by telephone, include your contact information in the description as well. If you do not provide any contact information, someone viewing your ad can still contact you by replying to your ad, and the BB will send you an email at the email address you gave when you registered an account. After you have described your item, and provided any necessary contact information that you wish to provide, you then need to click "OK" to submit your ad to the BB system. You will receive a notification message that your ad was successfully created, and you will be returned to the listing category page where you submitted your ad. However, your new ad will not appear on the BB until it has been approved by an approving official. We attempt to approve new ads promptly, however, please be patient. At this point, if you have additional ads to post, you can post those following the same steps as above. If you are done, you should now log out of the system by clicking the "Logout" link.